Imbibe magazine has started a new blog. It's just getting started, so keep checking in to get the latest scoop on everything good to drink. Bookmark it now or grab the feed for your RSS reader. 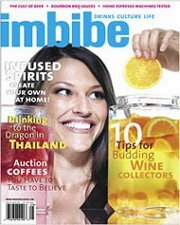 More information about Imbibe is available at their homepage, and you can subscribe here.